The shapes of fractals appear in nature all the time, but when I saw this Earth Observatory image from the International Space Station, I thought I was looking at a zoomed-in portion of the famous Mandelbrot set graphic. This picture wasn’t formed by the calculations of a computer, however. This is what nature does when chaos comes out to play. 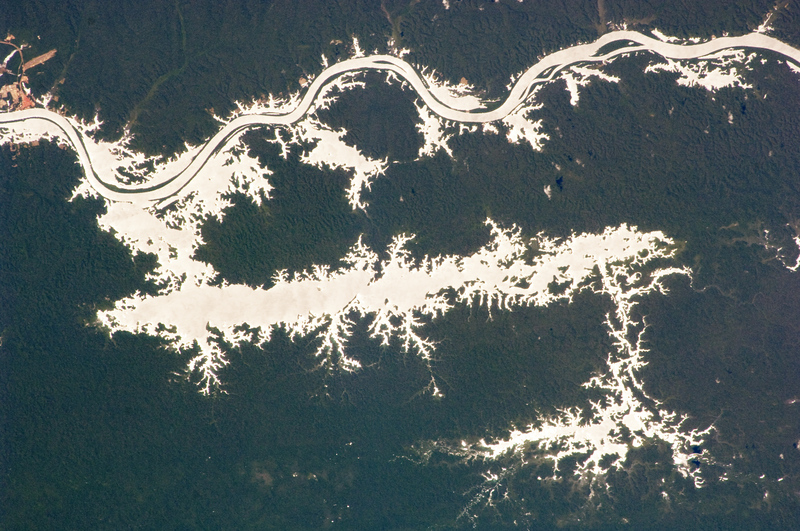 Imaged from orbit on August 25, 2009, an astronaut was able to get the timing just right with his/her Nikon D2Xs digital camera (plus 180 mm lens) so that sunlight was reflecting off Brazil’s Lago (Lake) Erepecu and Rio (River) Trombetas. Usually, water masses in the Brazilian Rainforest are too dark to be picked out in any detail, so this sunglint was very useful to pick out the fine detail of the waterways. The solar corona is a strange place. For the last few decades solar physicists have been trying to understand why it is so hot. Yes, it’s the Sun, and yes, it’s hot, but the corona is too hot. There are many possible solutions to the “coronal heating phenomenon”, but physicists are generally in agreement that this extreme heating is down to waves propagating along magnetic fields, interacting with coronal plasma, or by reconnection events (small explosions). In a study published earlier this year, scientists suggest that to account for the temperatures and densities observed in the corona, chaotic forces may be at work, regulating the scales of reconnection in the coronal plasma.